grass stains: Inadvertent tailgating is still rude, right? Inadvertent tailgating is still rude, right? Recently I was driving uptown to pick up lunch when I got behind a car with Tennessee plates. 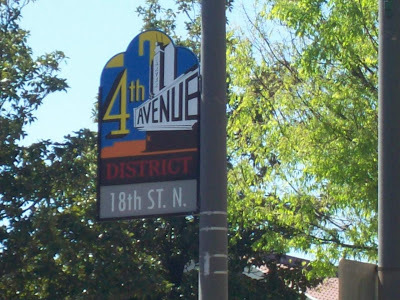 Normally, because our city streets are numbered from 1 to about 40, north to south and east to west, even out-of-towners don't have too much trouble finding their destinations. These must be pretty new, because I've never noticed them before. But they've been installed in about a four or five square-block area, and they certainly do make it more difficult to see which street you're trying to turn onto. 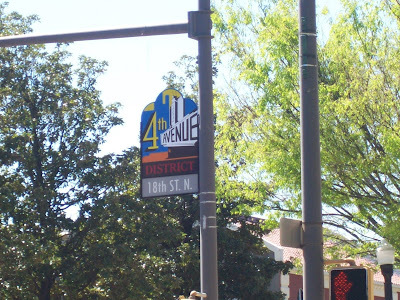 4th Avenue has apparently recently become the star of the downtown show. So, I owe this poor woman an apology, because even though I wasn't overtly rude and never honked, I did sort of ride her tail for several blocks. Sorry, lady! Hope you eventually found what you were looking for. Give it up to the fabulous Bham City Council....they're at it again! Have to see if I can find those today since I work downtown! Well, you can see they're pretty far north. I was on my way to Zoe's across the street from the Federal Building when I noticed them. I wonder if the person behind you while you took these pictures was tailgating. Hi, Katherine, yes, I do know BooMama, she & I go to the same church & have met up a couple of times. I missed out on the gathering at her house last year, but I know it was fun. I hope we can get another group together, there are a LOT of us here in B'ham. SET, I pulled over to the curb. So I classify myself as part of the SOLUTION, not the PROBLEM.